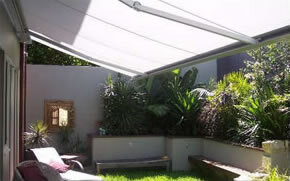 A retractable awning, patio awning, pergola awning or folding arm awning can extend your outdoor lifestyle. 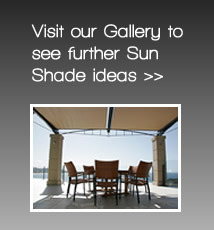 A retractable window awning or blind provides shade without shutting out the view. Our German designed retractable awnings are an ideal outdoor product for domestic applications such as patios, decks or balconies as well as commercial hospitality applications such as alfresco areas in cafes, restaurants, pubs and clubs. Awnings keep temperatures cooler inside and help reduce your electricity bills by up to 25% if you run air conditioning. 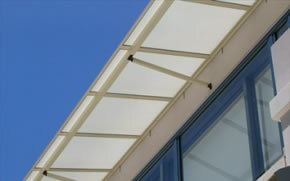 An outside awning can provide shade without shutting out the view. Our fixed awnings are an economical way to provide shade or rain protection for windows, doors or large outdoor areas such as decks or patios. The advantage of an external blind is that it keeps the sun off the glass and is far more effective at reducing heat than an internal blind. 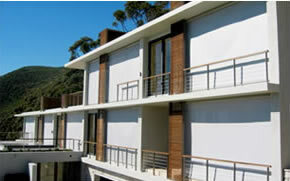 Exterior blinds and awnings can reduce entry of solar energy by up to 80%. A large range of fabrics are available including sunscreen mesh that allow an outlook even with the blinds down, translucent that wont darken a room but still provides privacy and blockout that will darken a room. 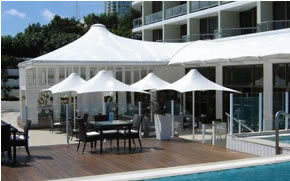 Umbrellas including market umbrellas, commercial umbrellas and cantilever umbrellas from Ozsun combine superior design, construction and materials to withstand the rigors of the most demanding conditions. Our extensive range of umbrellas includes our Designer Range for domestic and light commercial applications and our commercial range for all outdoor areas where superior quality and strength is required.